Welcome to Paradise! You will love our beautiful home! Located in the heart of old Seagrove, yet secluded from the hustle & bustle of everyday activity, is the neighborhood of The Grove by the Sea, a Seaside-like community of picturesque cottages. This home features three bedrooms, and two and half baths. With its oversized wrap-around screened porch, you can plan out your days on one of the world's most beautiful beaches. Spend your evenings on the screened porch enjoying the sea breezes, reading a book, playing cards or just having fun. You'll hope for rain at least once so you can kick back on the screen porch and enjoy the sound of falling rain drops on the tin roof. You'll never want to leave! The Grove by the Sea features lovely lanes bordered by abundant natural vegetation including Live Oaks which lead you to 2 community pools, a tennis court, a children's play area, bike paths and The Grove by the Sea is only a short 5 minute walk to the dedicated beach access. Seagrove Sunrise features hardwood floors on the main level, a fully-equipped kitchen with stainless steel appliances, granite counter tops and a dining area with seating for six. The home features a dedicated laundry room with a full size washer and dryer. The Living area has a Flat Screen Smart TV and a Blu Ray DVD player. Seagrove Sunrise is also equipped with password protected Wi-Fi. There are three bedrooms upstairs. The master bedroom has a King Bed with a Flat Screen TV. There is a Queen Bed in the secondary bedroom. It also has a Flat Screen TV. The third bedroom has Two Twin Beds with a Flat Screen TV as well. High thread count quality bedding and sheets exists in all of the bedrooms. 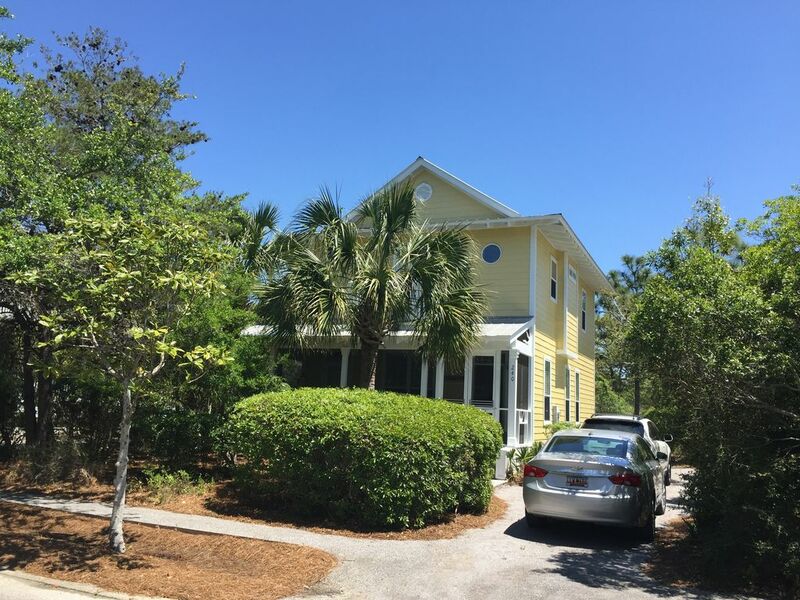 Perfect for that great night of sleep you will be seeking after a fun day at the beach or after an exciting day of bike riding on the bike trails of Scenic 30A. You will be only one mile from the famous town of Seaside, Florida. It's an easy bike ride as the bike paths along Scenic 30A that lead to Seaside connect with the neighborhood. You'll love Seaside! It has shopping, dining, and activities for the whole family! You can go the whole week without ever getting in your car. The Publix supermarket is a short bike ride away as well. You may go several days without driving your car. It is also just a short drive to Panama City Beach or to the outlet mall in Destin. Hello. We are the Holcombes. Welcome to our home at the beach. We hope you enjoy your stay at our cottage as much as we do. Thank you for visiting our web site. I vacationed with my parents on the Panhandle of Florida when I was growing up. So, the decision to purchase Seagrove Sunrise was easy when the opportunity presented itself in 2004. Now our trips to the cottage allow me to establish lasting traditions and fond memories with my wife and son. We enjoy the relaxing atmosphere that Seagrove Sunrise and The Grove by the Sea neighborhood gives us when we are here. We are a five minute walk to the most beautiful beaches in the world where we go every night to watch the sunset. Seaside is a five minute bike ride down the bike path that runs the entire length of Highway 30A. In fact, we will go several days without driving our car. One of my favorite things to do is sit on our screen porch and enjoy the sea breeze while taking a nap or reading a book. We are sure that you will enjoy our home as well. We furnish papertowels, sponge and garbage bags. Fully equipped kitchen including coffee maker and blender. There is one neighborhood tennis court. Short 2 minute walk to the pool. Wrap around screen porch is great for those night time seabreezes. This house is in a great location. Had an issue with the TV/internet. We were there during the hurricane Michael evacuation. The owners kept us up to date with all evacuation orders and guided us in the right direction when leaving, fueling up, etc. They also returned the funds we had paid for the two nights we couldn't stay. Nice house/yard/location but you really couldn't beat the owners. They were wonderful to us. Will definitely consider staying here again!! Very clean, so nice to deal with, great location! Seagrove Sunrise was perfect for our family's beach getaway! After searching for the perfect house for our first family beach vacation, we were more than pleased with the accommodations at Seagrove Sunrise! As a family of 6, with our 8-month old granddaughter, the layout of the house was just right and the wrap around screened-in porch was perfect for early morning coffee! The kitchen was well stocked (for nights when we ate in.). The beach was a short walk (around 5 minutes) and the Seaside square (just a mile away) offered the perfect food options for us to explore after a full day enjoying the beach, along with other food options nearby. The owner was very helpful and easy to communicate with and the house was well maintained. We will definitely consider booking this house for future vacations! I can't say enough good things about Seagrove Sunrise and Anne and Stan. The house is completely lovely--you feel like you are in a home and not a rental beach house. Great decor, everything you could need. Bed linens way better than standard rental linens. Screened porch is awesome. We rented bikes for the week and did not get in our car once. Definitely bike to Seaside in the mornings and get cronuts from Five Daughters. Anne and Stan were great with the communication, suggestions, and just about everything. We had the unfortunate luck of renting during the first May tropical storm in forever. The Holcombes were completely wonderful about the whole thing. Really a great experience. Thanks. The house was well furnished and kitchen had everything you could possibly need. Easy walk or bike ride to the beach ( 5 min. walk). Wonderful place to stay in Seagrove Beach. Beach and water were gorgeous. Close to Seaside and Water Colors and several area restaurants. Screened wrap around porch was a nice amenity. Air conditioning worked well and was quiet when turned on. We will be back! Great house for a small family vacation. Wonderful stay at Seagrove Sunrise! We just had an amazing week in Seagrove, and Seagrove Sunrise met and exceeded all our expectations. The master bed was incredibly comfortable and the house had everything we needed. The owners were a delight to deal with! We definitely recommend this vacation home! No pets. No smoking. Weekly rentals from Saturday to Saturday.